DECALS: You gotta be kidding! Uh, yeah. A history for a crawly thingie. Umm. The best I cansay about this is that it is one of a series of giant bug kits that was releasedby AMT before it was bought out by Racing Chumps and almost all of the decentmodel production ceased. While it is quite possible that this is an old Auroramold, I tend to think not, but could be wrong. There are at least two otherGiants in the series, a Scorpion and Preying Mantis. This is obviously aimed toward the younger crowd and those whoreally must have a big bug diorama. Frankly, it doesn't look that bad and thoughI have not seen these anywhere other than clearance houses, they are dated 1996so must have been one of the last kits molded by AMT before their takeover. Well, there it is in all its plastic and cardboard glory.Actually, the cardboard background is rather well done and folds to provide acorner. In addition to the bits for the bug, there are a number of terrifiedhumans to add to the scene. There is a façade of the power station and somepower tower girders for the tarantula to be bending in its haste to scarf up onyummy humans. The molding is quite good and there were few sink marks on thevarious parts. The car that is included is nothing more than a general shape. Iwould guess that the scale is around N gauge or about 1/160. A very nice touch is the inclusion of a construction stand forthe spider. This is basically a small plastic base on which to build thetarantula. It ensures that all of its legs are on the ground while the gluedries. The instructions are more than adequate and actually give paintinginstructions for the various bits and people. 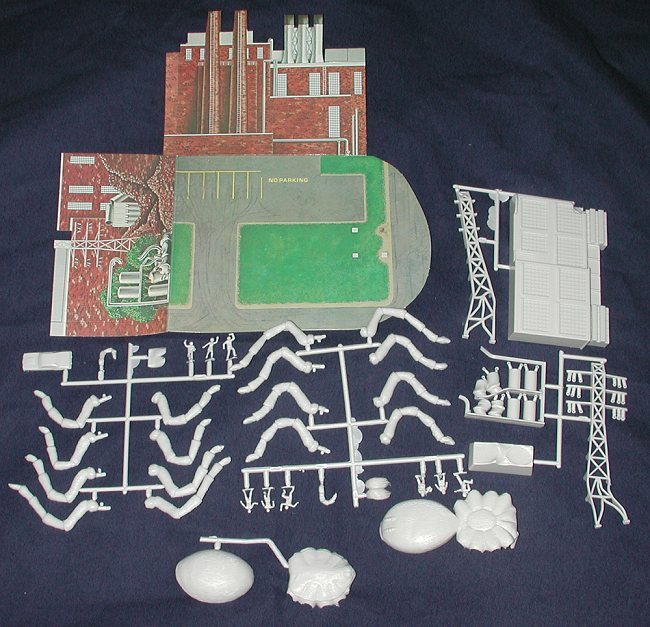 There is also a diagram showinghow to 'wire' the power lines and tower. Overall, it looks like a pretty neat kit and can be picked upfor very little money by shopping around.